The PartyGaming software is well known throughout the online gambling world, both by industry professionals and online gamblers. They offer reliable service and a completely unique experience that you won't find through any other software provider. PartyGaming has plenty of experience in the online gambling industry as they have been around since 1997, but it wasn't until 2006 that the company introduced their first online casino. PartyCasino quickly became one of the most popular online casinos out there due to the experience and reliability that comes with the PartyGaming software. 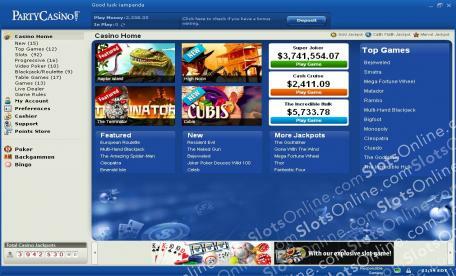 This online casino software offers players a long list of games to choose from, especially when it comes to slots. With nearly 50 titles to choose from, there is something to appeal to even the most discerning of tastes. Even better, all of the games offer brilliant themes, graphics, and sounds, making them especially captivating. Some PartyGaming titles include Monopoly Slots, Mission: Impossible, and Terminator Slots. Another feature that makes this software appealing is the fact that players from all over the world can access all of the PartyGaming casinos though their PartyGaming account. That means you can switch from PartyCasino to PartyPoker or even PartyBingo at the touch of a button. It’s more access to more games through a single account. Visit PartyCasino for the unbeatable experience that PartyGaming software has to offer. Party Casino is fast becoming the benchmark for online slots casinos, with easy to use software and original games like Top Gun, Frank Sinatra & The Terminator.